In the study of wildlife management what happened at the Kaibab Penisula is often used as an example to illustrate one of the basic principles of population dynamics. Where is the Kaibab Penisula? What happened there? What principle does this illustrate? The total aggregate of all environmental factors affecting the survival and growth of a given tree species can be expressed in a numeric form foresters call site index. What is the definition of site index and what two tree measurements are necessary to determine it? John, a forester, while taking a walk with his niece and nephew came upon a large oak tree in a field. He began answering their questions about where trees come from, how they grow, etc. Then they began discussing the uses of wood, the value of trees, and the size of that particular tree. Since John did not have his forestry equipment with him he cut a stick the length of his arm from his eye to his outstretched hand. He held the stick upright in his hand perpendicular to his extended arm and began backing away from the tree until he could sight across the bottom of the stick at the base of the tree and across the top of the stick to the top of the tree. What was John up to? What would he do next? What is a Biltmore stick? Where did it get that name? 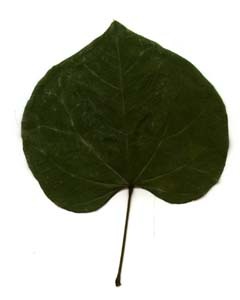 A green tree of forests of the Eastern United States; it has pinnately compound opposite net-veined deciduous leaves 6 to 15 inches long with 3 to 9 leaflets. It has a superior ovary with a 5 parted calyx and 4 to 6 stamens. The flowers are imperfect and the trees are dioecious. The fruit is a double samara each half long winged and one seeded. What is the scientific or latin name of this species? Kentucky bourbon soaks in solitude for years in quite warehouses built on Kentucky hillsides as it absorbs the flavor of the charred white oak barrels. Bourbon barrels are never made of red oak. Why not? and What has been its economic effect on the forests of North America? What is the scientific (latin) name of the tree which has leaves, fruits, and twigs like this? It is a decidious tree common in the Eastern United States and one of the most valuable timber species. What is the apical meristem? In temperate climates the wood of tree stems shows annual rings by which, as most people know, one can tell the age of the tree. These rings can also be used to tell the growth history of the tree and they enable a professional forester to draw some conclusions about the history of the stand as a whole. Why do annual rings occur? In cross section the tree stem consists of a center of pith, a zone of usually darkly colored wood, a zone of lightly colored wood, a layer of cells between the wood and the bark and, on the outside, the bark of the tree. 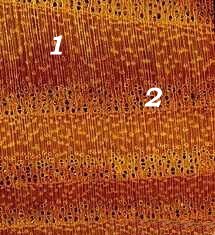 Give the name of the type of tissue in each of these four zones outside the pith and the function of each. A measure of the density of tree growth in a timber stand is the per acre cross sectional area of tree stems at breast height (4 1/2 feet above the ground). What is this measure of stand density called? 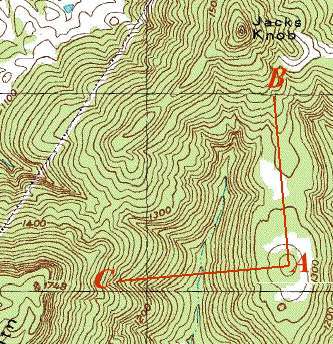 On the topographic map below the arrow marked 3 points to the text notation "BM 1148" and the circle marked one designates a hilltop. If all distances are in feet and the distance from the BM to the hilltop is 2300 feet horizonally what is the average percent slope within plus or minus 1%? What feature of topography is that area marked 2? On the topographic map below the arrow marked 3 points to the text notation "BM 1148". What does this mean? On the topographic map below what type of geographic structure is circled and marked 1 and how far above sea level is it at its highest point. 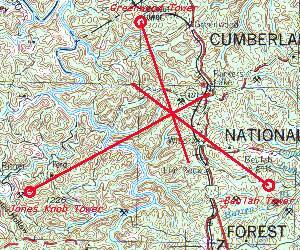 On a topographic map what is the meaning of the term "contour interval = 20 feet"? In the United States there are three popular formulas or methods for estimating the number of board feet of lumber which can be produced from a given log. These are called "log rules". Name any two of these. What is the standard height for measuring the diameter of the trunk of a standing tree and what is this diameter called? It is an aromatic tree common in the Eastern United States with three types of leaves on the same tree. 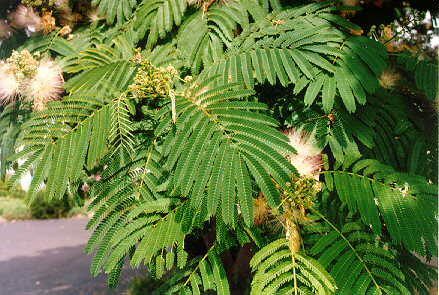 What is the scientific (latin) name of the tree which has leaves, flowers, and twigs like this? It is a decidious tree common in the Eastern United States. What is a relascope? What is its use? What is the scientific (Latin) name of the tree which has leaves like this? It is a deciduous tree common in the Eastern United States with bark that is broken into long shaggy plates. It is considered an important mast producer for wildlife. It is a deciduous tree common in moist soils in the Eastern United States. I have 100 acres of northern red oak trees, Quercus rubra. The average circular spacing between trees is 37 feet. These trees when 50 years old were 70 feet tall. They have an average merchantable height of two 16 foot logs per tree. If these trees are 22 inches dbh and have a form class of 78 and if this grade of red oak is selling at the local sawmill for $600.00 per mbf, International 1/4 inch log scale and if the total cost of felling, skidding, bucking, loading and hauling to the mill is $100.00 per mbf., what is the total dollar value (to the nearest $1,000) on the stump of this tract of timber? Is this a good site for growing Quercus rubra? According to Mesavage and Girard a Form Class 78, two log tree with a dbh of 22 inches contains 368 board feet International 1/4 inch log rule. What is likely to happen when Pinus spp. 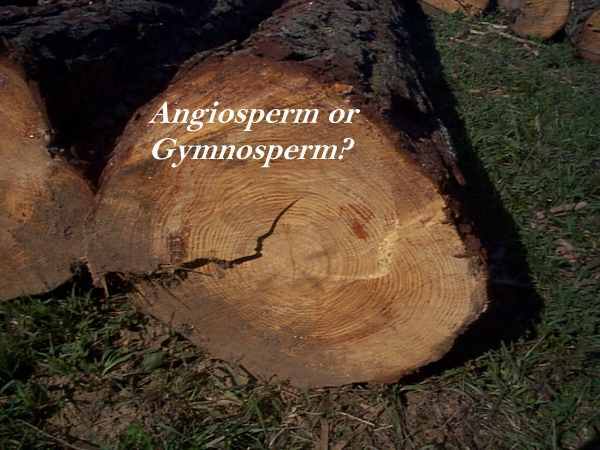 is interplanted with Juglans nigra? 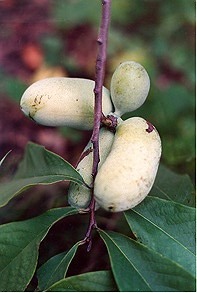 A member of the Ebony family in North America, this forest tree has a fruit that is delicious after frost but if eaten before a good frost the bitter fruit will cause the mouth to pucker. Give the scientific name of this tree and tell the use of its wood in sports. 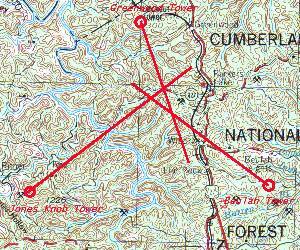 On the topographic map below the circle marked one designates a hilltop. If a person walks East from one to the place marked four is he walking, in general, uphill or downhill and when he arrives at four how much will his elevation have changed? Answers to the nearest 100 units are fine. What silvicultural tool can be used both to enhance germination of lodgepole pine seeds and to help control brown spot disease in the grass stage of longleaf pine? What is the term used for the ratio of the diameter of a tree inside bark at the top of the first 16 foot log to its diameter outside bark 4 1/2 feet above the ground? It is a deciduous tree from Asia common as an ornamental in the United States. In point sampling with a wedge prism, Basal Area Factor 10, the plot radius factor is 33. If a tree is 10.8 inches in diameter breast height and it is located 30 feet from the plot center, will the forester measure this tree in his variable plot radius cruise if he is using a BAF 10 prism? Why or why not? 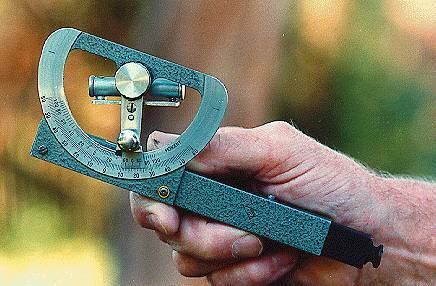 An alidade is used for triangulation. How and for what purpose? 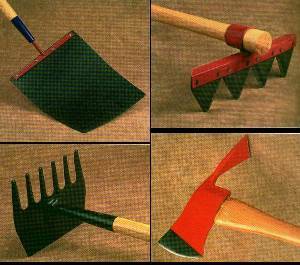 What are a pulaski, a mcleod, and a council rake used to construct? Why are we told to "Never undercut with the line"? All the above questions must be answered completely, specifically and in terms relevant to the subject. It is a deciduous tree common in the Eastern United States. The leaves are palmately compound. Carrying the fruit of this tree is said to bring good luck and/or prevent arthritis. What are Naval Stores? They are produced in what area of the United States? What species of trees are mainly involved? This man is collecting data to radio to the dispatch room. Specifically, what data is he collecting and how will the dispatcher use the data he sends? In wildlife management mast from Carya spp. has been described as ice cream while mast from Quercus spp. has been described as meat and potatoes. Explain? 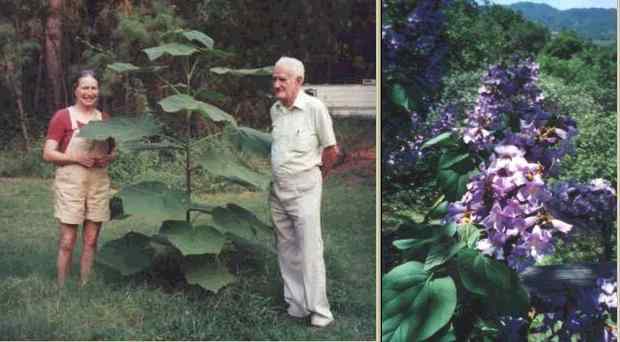 This dioecious tree with doubly pinnately compound leaves grows in the Midwestern United States. 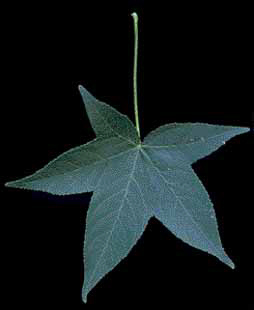 The leaves, up to 32 inches long, are some of the largest leaves found on any tree. The fruit contains a large legume seed with a very hard seed coat. Scarification is necessary before germination can occur. 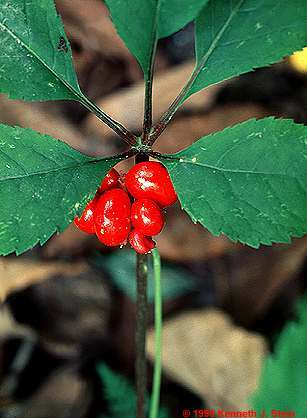 The seeds are said to be poisonous but were also said to be used by early settlers to prepare a bitter drink as a substitute for coffee. What is the scientific (Latin) name of this tree pictured below? Late summer travelers along Interstates and other major highways in the Eastern United States, especially in Kentucky and Tennessee, often see a brown discoloration on mountainsides visible from the road. On closer inspection this color is seen to be caused by the fact that the inner tissue of the leaves of black locust trees (Robinia pseudacacia L.) is missing. What has attacked these trees? Born in 1887, a forest ranger and ecologist in the desert southwest, he died in 1948 while fighting a brush fire. He wrote extensive wildlife management texts. Who was this man, considered the father of the modern conservation movement? On a topographic map with a scale of 1:24000 how many inches on the map represents a mile on the ground? How many gunter's chains is this? When using a steel tape to measure horizontal distances on sloping ground it is sometimes necessary to "break tape". What does this mean and why is it done? Joe and Sally met in their freshman year of high school. Young Joe was so smitten with her that he took Sally to a nearby woodland where he carved a heart and their initials into the bark of a young beech tree. Joe and Sally were a couple all through high school and after high school they married and moved North where they raised a son and two daughters and worked at various jobs for 35 years. They then retired and moved back to their old home town. One day Joe suggested to Sally that they return to the woodland and find "their" beech tree. They went there one beautiful autumn afternoon and searched the sun dappled woodland walking through piles of brightly colored autumn leaves. After a while they found the old beech tree still standing. Joe and Sally had been gone for 35 years. That plus the four years of high school means that 39 years had elasped since the initials were carved. If the beech tree grew in height 5% of its height for the first ten years, then 3% for the next ten years and then 2% for the last nine years, how high up the tree would Joe and Sally have to look to see their carved heart? Assume that the heart was originally carved at eye level or about five feet above the ground. Black Cherry and other Prunus spp. trees in the eastern United States often appear as in the picture below in the spring of the year. What causes this? Which of the following is not an angiosperm? in a Northwesterly direction 55 paces to the beginning. Approximately how many acres are in the tract? Name these tools. Be specific. "Where, oh where, is dear little Susie?" "Pick 'um up and put 'um in your pocket." 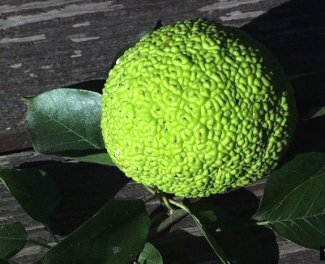 "the largest tree fruit native to the United States." 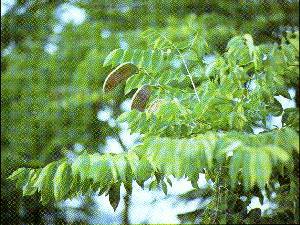 A green tree of forests of the Eastern United States; it has pinnately compound opposite net-veined deciduous leaves 8 to 12 inches long with 5 to 9 leaflets whitish beneath. It has a superior ovary with a 4 parted calyx and 2 stamens. The flowers are imperfect and the trees are dioecious. The fruit is a double samara less than 12 mm long each half winged with the wing decurrent less than 1/3 of the body length and one seeded. What is the scientific or latin name of this species? How is its wood important in sports? Where have all the elms gone? (long time passing.) Use scientific names. Before dinner I decide to have an "old fashioned". What tree species is involved in the production of the liquor in this drink? How? My dinner companion orders a "gin and tonic". What genus of trees or shrubs is involved in the production of the liquor in this drink? How? What is the term for the ratio commonly expressed in the United States as the ratio of the dib at the top of the first 16 foot log to the dob at breast height? What is the name of the instrument below used in measuring slope and height of trees? There are three most probable explanations for this. What are, at least, two of these? What is the scientific name of this understory tree of the southern and mid-western United States? It is a member of the legume family. 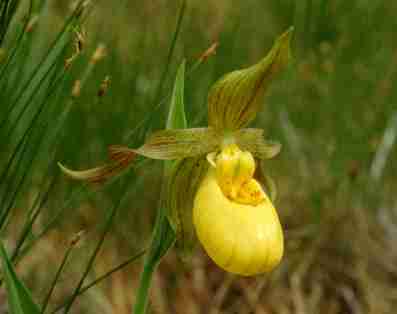 It often is seen blooming profusely on abandoned fields on hillsides in eastern Kentucky in early spring. A moist cove in the Smokey Mountains with an overstory of beech, yellow poplar, hemlock, and white oak; a closed canopy and deep topsoil. Which of the following species are most likely to thrive in the understory? What is this weird growth on a cedar tree? Although not looking like this, it can also be found on another kind of tree. What kind? This common woody vine is usually avoided by foresters. What is its common and scientific name? What are the three legs of the fire tripod, removing any one of which will stop the fire? Which one is most commonly removed in fighting forest fires? 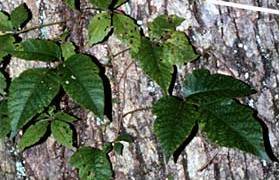 The major introduced pest of eastern United States hardwood forests is native to Europe and Asia. It was originally introduced in Massachusetts in 1869 in an effort to begin a commercial silk industry in the United States. Identify this tree defoliator which spreads over long distances when egg masses are unknowingly transported from infested areas on vehicles. Which of the following does not belong? Is the relationship between the position of an animal in the food chain and the carrying capacity for that animal in its environment direct or indirect? Explain. In regard to autumn color sort the following species of trees and shrubs of eastern United States into two groups as to whether the leaves are predominately red or yellow in the fall. Foresters soon learn to evaluate the quality of a site for timber growth by means of the understory vegetation, flowering annuals and perennials and shrubs. The parasitic shrub below has been believed to extinguish fires, promote conception and ward off evil spirits. What is its common name? This evergreen has very white wood. What are its common and scientific names? Foresters, Joe and Steve, were each sent to cruise two different timber tracts. They each collected data on 40 variable radius plots, returned to the office, analyzed their data and presented the following information to their boss. The boss said, "We need to be 95% confident that we are accurate within plus or minus 15% of actual volume on each cruise. You will both have to take additional plots to obtain this accuracy." On approximately how many additional plots should each forester collect data? The distinctive bark pattern of this tree, native to eastern United States, makes it easy to identify at a distance. The mottled brown and white pattern is caused by the exfoliation of the outer bark exposing the lighter creamy-white inner layers. What species is this? Scientific name, please. Which of the following does not belong and why? On the map below identify the three circled symbols. Symbol number 1 is a triangle. The number "1517" is written there. What does this number mean? A compass needle points to the north magnetic pole rather than toward the north geographical pole (true north). The angle formed between magnetic north and true north is called declination, and allowance must be made for this factor in converting magnetic bearings and azimuths to true angular readings. Depending on the location of the observer on the earth the correction for declination varies and may be either to the east or west of north. However, if the observer is in a place on earth which is in a straight line with the true and magnetic north poles the declination is zero and no correction is needed. What is the name of this imaginary line around the earth where the declination is zero and what is the general term for all lines connecting points with equal declination? In point sampling if the ratio of tree diameter (dbh) to plot radius is 1:19, what is the Basal Area Factor (BAF) and what is the per acre expansion factor for an 18" dbh tree? In even aged southern pine plantations a 30,000 acre working circle has an average 60 year rotation length in the management plan. If annual harvests are desired and the compartment size is set to roughly equal an annual logging chance, what is the average compartment size? How would one compute the allowable annual harvest? 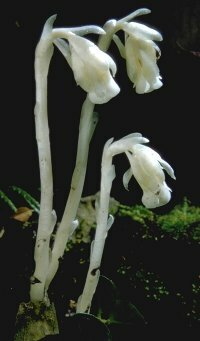 This delicate woodland flower is infrequently found in appalachian hardwood forests but is fairly common in some parts of Canada. Give both its common and scientific names. Which one of the following does not belong and why? 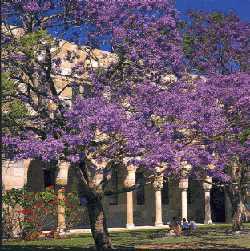 A native of Brazil and Argentina, this tree is a widely planted ornamental in Australia and grows best in tropical and semi-tropical areas. Please give the scientific name and family. If a timber stand has an average basal area of 70 square feet per acre and contains an average of 100 trees per acre, what is the average dbh in inches? 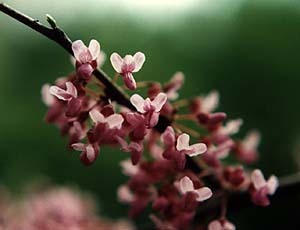 This tree from eastern Asia is a widespread ornamental in the southern United States and elsewhere. What are its common and scientific names and what happens to its leaves at night? How is Morus alba related to Bombyx mori? All members of this family are achlorophyllous and hence entirely dependent on their mycorrhizal associations with fungi for all nutrients. 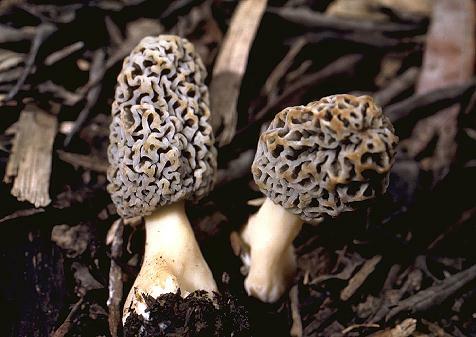 These fungi in turn also have mycorrhizal associations with forest trees, so that members of the family could be thought of as parasitizing the latter relationship. What family is this and what is the common name of this plant? According to the International 1/4 inch tree scale an 18 inch dbh white oak 2, 16' logs in merchantable height with a form class of 78 will yield 233 board feet of lumber. If I am point sampling using a BAF 15 prism and I count two of these trees on one sample plot, how many square feet of basal area per acre will they represent? Suppose I have a timber tract with 1,000,000 board feet of grade 2 trees worth an average of $150 per thousand board feet on the stump. Suppose that grade 1 timber is worth $250 per thousand board feet. Suppose I know that the average annual inflation rate over the next ten years will be 3%. Suppose that I know, due to the site quality of my land, that my timber will grow at an average rate of 5% increase in volume annually for the next ten years. Since my timber is hardwood timber such as oak and maple, suppose I also know that 5% of its volume will change from grade 2 to grade 1 each year as it matures due to the larger log sizes. Suppose I also know that if I invest my money in mutual funds in the stock market, I can expect to get a 10% return on investment annually for the next ten years. Should I sell my timber and invest the money in the stock market now? Explain why or why not. Timber stands can be improved by killing unwanted trees. One way to do this is by girdling, cutting a ring around the trunk of the selected tree. Why does this kill the tree and what must the girdle accomplish to be sure to kill the tree? In what two ways are these significant in the forest? I went for a walk on my farm yesterday. 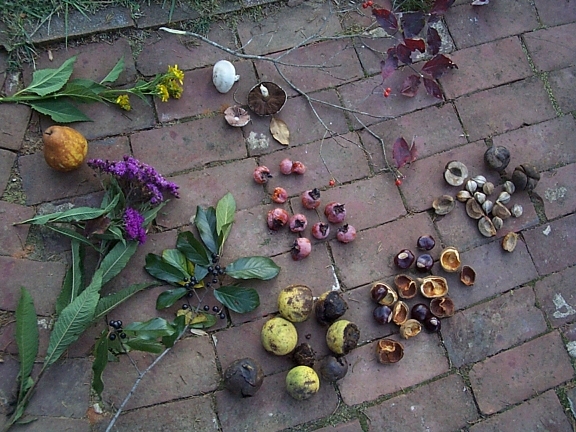 Since it is fall and frost can be expected soon, I remembered that this is the traditional time in Kentucky to gather wild fruits and nuts. So I returned from my walk with the stuff pictured below. The products from woody plants have been circled and lettered, A-G. Please give the latin name of the genus of, at least, five of these seven items. Common and scientific name please? Quarter sawn oak is more expensive than plain sawn oak. What do these two terms mean and what is the advantage of quarter sawing oak? What causes the "flecks" in quarter sawn oak flooring? What is a coppice stand? Below is a micro photograph of White Ash, a ring porous wood. The number "1" marks latewood. "2" marks earlywood. If the summer is rainy so that more latewood than usual grows and the ratio of latewood to earlywood increases what effect will this have on the specific gravity of the wood? Explain? 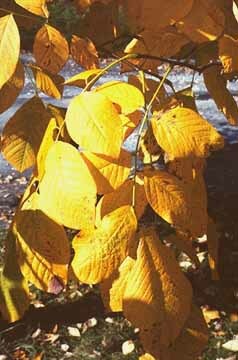 This tree, native to the Appalachian mountains, Missouri, Oklahoma and Arkansas has very hard strong durable wood and is often used for fence posts. When the nectar of the flowers is harvested by bees it makes delicious light colored honey. Please give the common and scientific names. 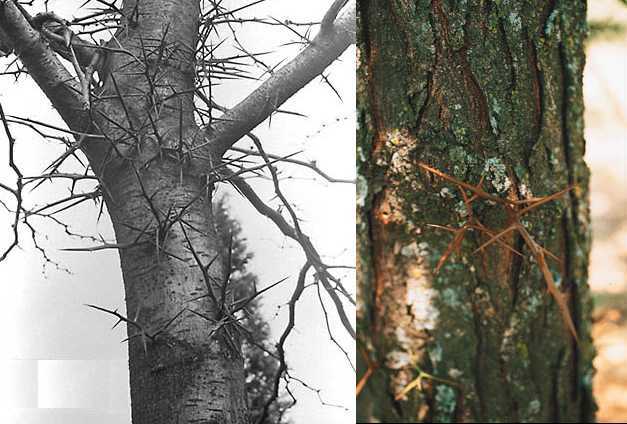 This disease resulting in a canker or swollen area on the limbs or trunks of pine trees in the southern United States spreads to the pine trees by means of orange spores produced on infected oak leaves. What economically significant disease of southern pines and oaks is this? 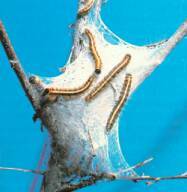 What is the scientific name of a bacteria (widely used as an insecticide) that kills leaf eating caterpillars such as eastern tent caterpillars? In the spring people search woodlands for these. What are they (genus name) and what is their attraction? In the midwestern United States a hopeless situation is described as "being in the center of a forty acre field and being charged by an enraged bull with only one tree available to climb and it being the one pictured below." What is the common and scientific name of this member of the legume family? A hardwood log is graded based on the third best of four faces of the log. How are the locations of these faces determined? What is the difference between a "clear cut" and a "high grade" timber harvest? Which produces the most short term monetary profits? In which type are more trees cut? I cruise a tract of timber and take sample data at 60 plot locations. In the office later I find that the mean volume per acre is 3,000 board feet. I calculate the standard error of the mean for the 60 plots and find that it is 300. I then state that I can be 95% confident that the actual mean volume per acre is 3,000 board feet plus or minus 588 board feet. I calculated this 1/2 confidence interval of 588 board feet by multiplying 300 by 1.960. Where did I get the factor 1.960 and what is its meaning in terms of a normal distribution? What are both the chemical and silvicultural differences between 2,4-D and 2,4,5-T? What impurity caused 2,4,5-T to be banned in the United States? At Lake Tucurui in far northern Brazil they are cutting Brazilnut wood, mahogany, ipe, angelim, jatoba and massaranduba. Spread over 1,110 square miles the timber, worth at least $100 million, has been dead for fifteen years. The logging operation is unique. Why is the logging operation unique, what killed the timber and why is the timber still valuable after being dead for so long? If I have a southern pine plantation which of these two would be of concern to me? Peshtigo, Wisconsin was only about 240 miles north of Chicago on October 8, 1871. That night the great Chicago fire was started, it was said, by Mrs. O'Leary's cow. However, the Chicago fire was not the big news in Peshtigo the next day or, for that matter, during the entire month of October. Why not? This summer the trees in my southern pine plantation began to die so that the stand looked like that in the photo below on the left. On closer examination I found sawdust at the bottom of the trees and pitch tubes as pictured in the photo on the right below on the trunks of the trees. What forest pest is killing these trees? Increase the coefficent of variation? Decrease the coefficent of variation? 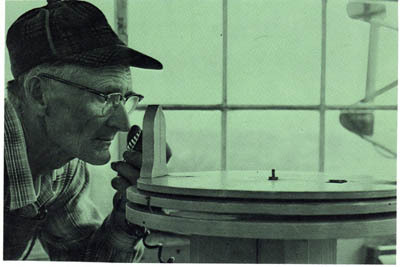 This forester is looking through an instrument with 3 widths of field of view. They are marked 5, 10 and 20. What is the instrument called? For what is it used? What are the meanings of the numbers: 5, 10 and 20? About 3600 pounds of hardwood, 128 cubic feet but actually only 65 to 90 cubic feet, probably around 80. What is it? Why the differing numbers of cubic foot volume? What is the term for chemicals responsible for the astringent taste of unripe fruits and used in the process of transforming animal hides into leather. They are extracted with hot water from the bark of chestnut and oak. During a particularly dry fire season with a shortage of fire fighting personnel I saw this forest fire from a plane about 30 minutes after it had started at about 2 pm. 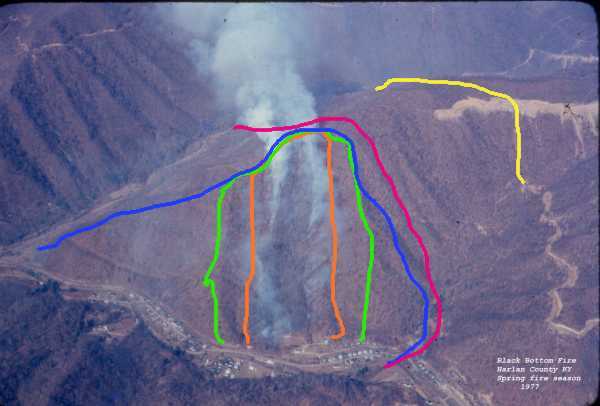 I knew it would take me about two hours to land, get a fire crew to the fire and walk to the top of the mountain to begin constructing a fire line with hand tools to contain the fire. Which of the colored fire lines did I plan to construct? Discuss the disadvantages of the others. For what do we use a spud and a timbershave? How is a peavey different than a canthook? What do we call a canthook with a wooden or steel rocker installed at the lower end of the handle opposite the lip and what is the purpose of this? The bird below is a resident of Kentucky woodlands whose population is small and endangered. The insect pictured and enlarged at the right is about the size of a grain of rice. 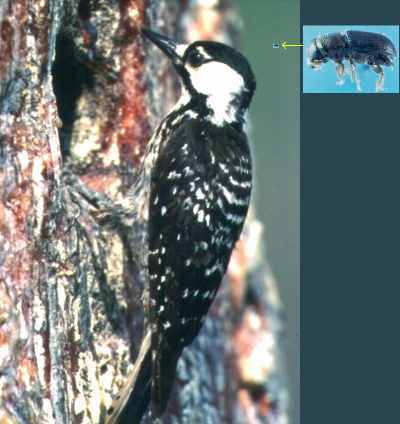 Why is it feared that the activities of this small insect may cause the extinction of the population of this bird in Kentucky? What species is the bird and the insect? The largest known living organism on earth lives in the western United States. What and where is it? 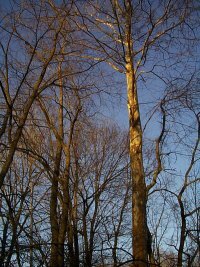 I found this list of species of Virginia forest trees. They were in three groups. I removed the headings of each group. 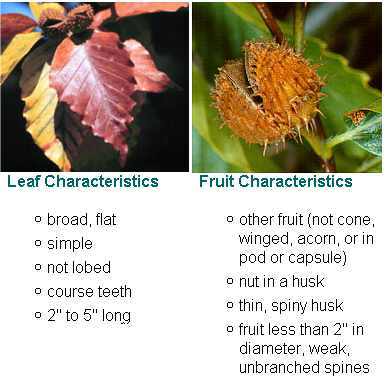 By what silvicultural characteristic where these species divided into these groups and what should be the heading on each group? This fast growing tree is an imported ornamental species in the United States. 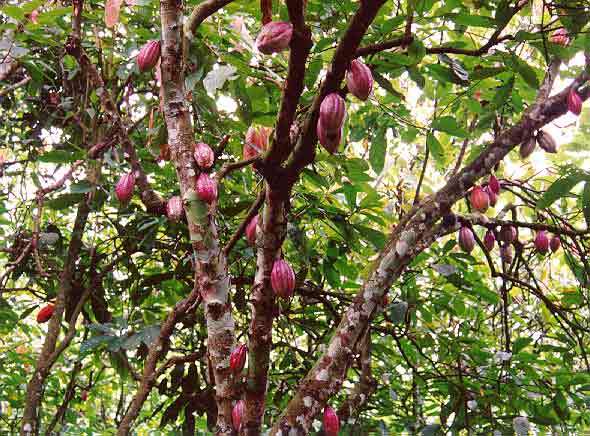 Escaped trees are sometimes found growing wild in forests in the eastern part of the country. What species is it? On a BAF 10 point sampling timber cruise each 20 inch dbh tree measured represents how many such trees per acre? What genus of Pinaceae is deciduous? This Tree of the mulberry family is unique in its method of growth. From its center, broad branches extend outward sprouting aerial roots that hang down. When they grow long enough to reach the ground, they take root and thicken, becoming wooden pillars. By spreading in this way, a single tree can become a forest. The lines A-B and A-C on the map below are exactly the same length. If I want to exercise to burn the maximum number of calories and I am standing at A, should I walk to B or to C? 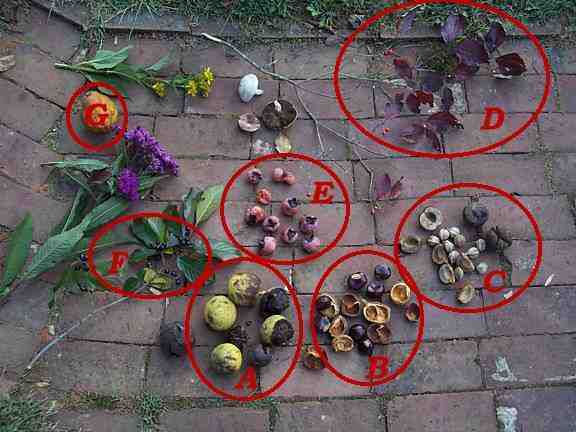 They are grouped based on form of the plant (tree/non tree). Please put these plants in two groups of five on a different basis and explain your reasoning. Why have most of the dogwood trees in the Great Smokey Mountains National Park died in the last few years? If I tell you that my forest consists mainly of Archaeopteris spp., what do you know about me? It will be noted that the distance and direction of the last deed call are not given. What is this distance and direction and how many acres in area is this tract of land? While gathering firewood for a campfire one night I happened upon an old tree stump that glowed in the dark with an eerie pale bluish green light. I added a piece of it to my load of firewood and when burned on the fire the flames turned a strange color. What are sclerenchyma cells and why are they important to trees? What tree, native to forests in the eastern United States, is this? Fruit - a shiny oval red drupe. 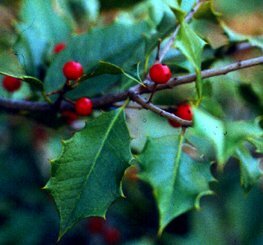 As I am walking in a forest in the Appalachian mountains I see around me trees that are mostly scarlet oak, chestnut oak, hickory, and pine. As I continue walking I notice that the forest type has changed and I now see yellow poplar, beech, hemlock and maple. Have I been walking uphill or downhill? How do you know? A recent timber cruise in the Appalachian mountains of Kentucky of a forest consisting mostly of oaks, yellow poplar, hard maple and hickory trees showed about 50 trees per acre more than 12 inches in diameter breast high with an average of 200 board feet doyle scale per tree and an average of 92 square feet of basal area per acre. Since the state Division of Forestry recommends planting 800 to 1000 trees per acre and this stand only supported 50 sawlog size trees per acre, a local farmer said that the stand, as I described it to him, didn't seem to be very well stocked with trees. He was wrong. Please put the numbers above into perspective by explaining what numbers would be expected on an average stand and on a well stocked stand of this type and why there is such a discrepancy in number of trees per acre planted and number harvested. What tree genus, native to forests in the eastern United States, is this? A forester from Europe visiting me in the American midwest asked me, as we looked over a forest tract, the size of the tract. I told her it was a section. She was not able to understand this unit of measurement until she had mentally converted it to hectares. How many hectares would this section contain? one inch = 2.54 centimeters. one hectare is one hectometer squared. a section is 80 gunther's chains squared. A common recommendation for planting tree seedings is to plant 1,000 seedlings per acre at a 6 foot by 7 foot spacing (trees 6 feet apart in rows 7 feet apart). If I have a bundle containing exactly 1,000 tree seedings and I measure carefully to space the trees 6 X 7 feet, will I be able to plant my entire acre or will I have tree seedlings left over? I will be short or over by how many seedlings? How many seedlings will I require per acre if I decide to instead plant the trees at an 8' X 8' spacing? 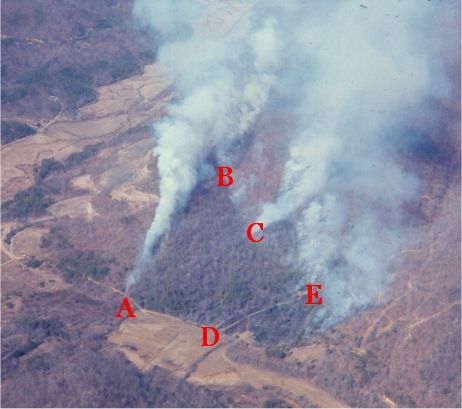 Where do you think this forest fire originated? Why? Imported from:   Eastern Asia, 1907. Distribution: Eastern United States and Western Australia. Freely suckers, deep taproot. Disturbance of roots encourages massive regeneration of new suckers. Leaves consist of up to 20 pairs of leaflets (opposite each other). Flowers are green-white, fruit red/yellow/green colour. Leaf extracts contain allelopathic substances which restrict the growth of other plants. For this reason, the trees are often found in thick stands with no discernible competition. 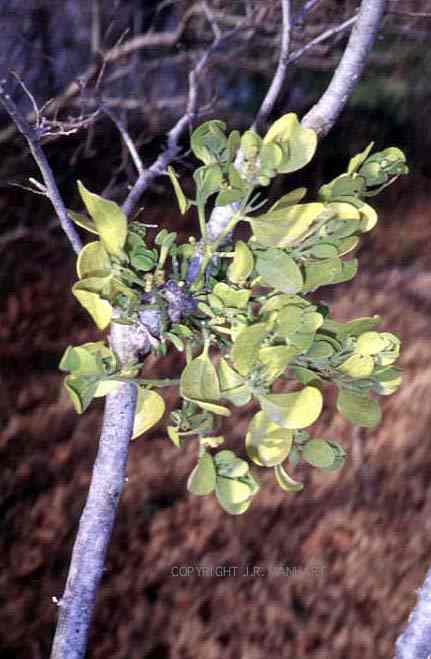 Contact with plant at flowering time (late Summer to Autumn) causes dermatits. Leaves and flowers have an unpleasant odor. I have a stereo pair of aerial photographs of a level wooded area. I understand that the focal length of the lens in the aerial camera is 12 inches. I measure the distance on the ground between two road intersections shown in the photo and find it to be 1600 feet and then I measure the same distance as shown in the aerial photo and find it to be 4.8 inches. I measure the distance on one of the photos between the center of that photo and the image on that photo of the point at the center of the other photo of the stereoscopic pair and find it is 2.550 inches. Using a parallax wedge on the stereo pair I find that the differential between the absolute stereoscopic parallax at ground level and that at the top of a specific tree in the photos is .058 inches. What is the estimated height of the tree? You must decide whether to hire a fire lookout for the summer on a National Forest. His salary and per diem allowance will cost $1,000. Your decision will be based on the probability of a severe summer fire on the forest. Set up a two way table of possible outcomes and calculate the mathematical expectation of gains or losses from the following data. Then calculate the combined expectation of loss if he is hired and the expectation of loss if he is not hired. If no severe fires occur and a lookout is not hired, you will save his salary of $1,000. If a severe fire occurs and a lookout is not hired, you will lose $3,000. If a severe fire occurs and a lookout is hired, you will lose $1,200. The probability of a severe fire is 0.60. What do these plants have in common? In a BAF 10 point sampling timber cruise I have measured between 300 and 400 trees on 60 sample plots. Putting these measurements into my forest analysis computer program, I have now created a stand and stock table for the sampled forest which reports number of trees, timber volume and timber value by 1 inch diameter class. If my task is to estimate volumes and values of timber at a time in the past when the trees were two inches smaller in diameter than now, should I simply reduce the diameter of each measured tree by two inches and run the trees through the program again or should I take the number of trees in each diameter class in the stand and stock table and move that number down two inches in the table applying the average volume and value for the new class to the new number of trees now in that diameter class? One of these methods is much more valid than the other. Why? Assume that timber prices are constant during the period. What is the significance of each of these trees? The Mendocino tree, a redwood, west of Ukiah, California? Methuselah, a bristlecone pine tree, near the Nevada California state border? General Sherman, a giant sequoia, in Sequoia National Park, California? What one word is brought to mind by these trees? What is a "witches'-broom"? What is a gall? What is cecidology? Foresters in surveying a tract of land sometimes use a table listing the position of one or more celestial bodies for each day of the year. The French publication, Connaissance de Temps, founded in 1679, is the oldest of such published tables. What do we call such a table? Why do surveyors sometimes need such information? A recent visitor to our pages emailed us to give the correct scientific name and the reason based on Latin usage that it is correct. Please see if you can also give us this answer. I can download from the internet a Digital Elevation Model before cruising a timber stand or mapping a forest area. What is a DEM? Where would I get it? How would I use it? A forest manager decided to set up a continuous forest inventory system in which permanent plots are resampled on a periodic basis, such as every five years, to give ongoing reports on the status of the forest. He planned 250 permanent plots on a 60,000 acre forest. He said that the plots should be conspicuously marked on the ground so that they could easily be found for each periodic forest inventory. A mensurationist suggested to him that marking the plots in such as way was probably not such a good idea. Why not? Carotene (the pigment found in carrots and corn) causes maples, birches, and poplars to turn yellow. The brilliant reds and oranges in this fall landscape are due to anthocyanins. Tannins give the oak a distinctively brown color and is the final persistent color most leaves turn before becoming part of the forest floor. Why do we see these colors in tree leaves only in the autumn? Pycnidia, apothecia, mycelium. To what am I referring? Some of the following do not belong here. Which do not belong and why? The cambium is between the xylem and the phloem. Further describe these three types of cells and their functional purpose. If I say, "Xylem up and phloem down", of what processes am I reminding myself? Which one of the list below does not belong and why? Which cannot reproduce and survive under a closed forest canopy? When hardwood is sliced into veneer sheets for use in furniture and door surfaces, etc. the sheets are carefully kept in the order that they came from the log. Why is this order important? A virginia creeper vine has climbed up and around to the top of a cylindrical pine tree trunk in a helical manner. The tree trunk has a height of 375 inches and a circumference of 40 inches. If the creeper covers a vertical distance of 75 inches in one complete twist around the tree trunk, what is the total length of the creeper? I have decided to sell some of the hardwood timber from my woodland. To decide where I can get the best price I decide to check prices at nearby sawmills. Mr. Jones at a sawmill about ten miles from my woodland says, after I have described the timber to him, that he can probably pay me an average of $300 per thousand board feet. I then continue on down the road another five miles to Mr. Smith's sawmill. He says he can pay me $275 per thousand board feet. "Sorry", I say, "But Mr. Jones is willing to give me $300 per thousand." "Yes," says Mr. Smith, "but Jones has a 1/4 inch kerf circular saw and buys on doyle log scale. I, however, have a 1/8 inch band saw and buy on international 1/8 inch log scale, so you should sell to me." What is Mr. Smith talking about? Where will I get the best price for my logs? 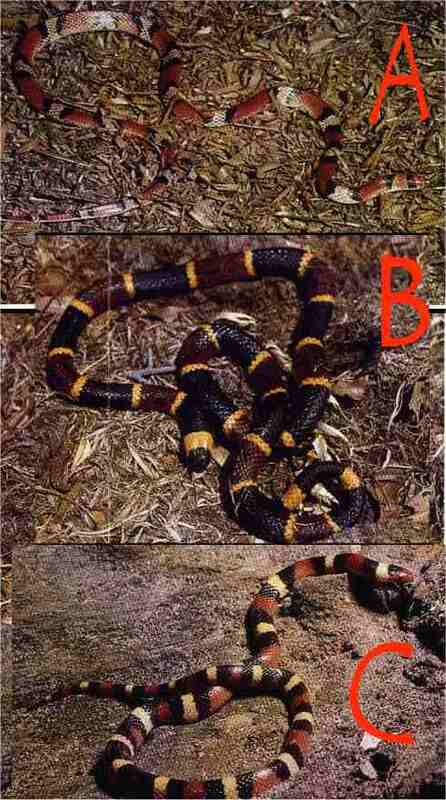 Below are pictures of examples of three species of snakes that might be found in forests on the east coast of North America. 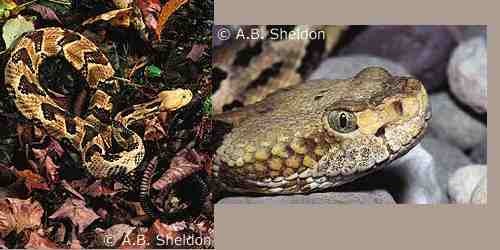 Which of these is poisonous? What species is it? How does one distinguish that species from the others? Do I reside in New York, Kentucky, Georgia, Nebraska, Texas or California? Walking in the forest I see mahogany, ipe, angelim, jatoba and massaranduba. I am a broad leaved tree. I do not have needles or scales. My leaves are simple not compound. My leaves are serrated not lobed. My leaves are doubly toothed around the margins of the leaf (doubly serrate) and asymmetrical at the base. My leaves appear alternately on the stem, not opposite each other. I have a dry, 1-seeded fruit with a wing. I appear throughout Eastern North America. This is the fruit of what tree? Please list the numbers 1 through 4 on the topographic map fragment below in order from lowest to highest in elevation. What tree is this? Scientific name please. My GPS tells me that my home is North 36 degrees 42.461 minutes and West 85 degrees 05.430 minutes at 951 feet elevation. I am deep in the woods at Jack's Knob. The GPS says it is North 36 degrees 44.271 minutes and West 85 degrees 05.414 minutes at 1580 feet elevation. If the batteries give out on my GPS and I have to navigate my way home by compass, how far will I have to go in what direction? What species, utilized by golfers, is this? The trees below are divided into two groups. What is the basis for this division? 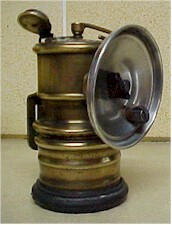 The lamp below was used for years by forest fire fighters fighting fires at night. It does not require batteries and it is useful in setting backfires. What kind of lamp is it and how does it work? Jump back to War of the Minds. Last revised November 19, 2003. All contents copyright (C) 2001, Duane Bristow. All rights reserved.